Check out the Official Body Buster BLOG! MAKING A COMMITMENT TO YOUR HEALTH AND FITNESS! FEBRUARY 11TH...AND WE WANT YOU! CLICK HERE to see footage of our 2013 Charity Boot Camp Classes! All 2013 charity bootcamps were a huge success! The Body Buster team and our amazing members raised money for 2 different charities in Toronto and Langley. Thanks again for all of your support and some DIEHARD classes! Check out the Body Buster Fitness YouTube channel to see more Fitness Videos! Beat the February "Blah's" with Body Buster! February can be a bit of a hard time of year! The weather is drab, cold and we don't see much sun. Exercise seems to be a thing of the past because we spend so much time indoors, at work and at home. This time of year tends to put us in a dull mood, otherwise known as the February Blahs! We've all been there! So why not do something about it? 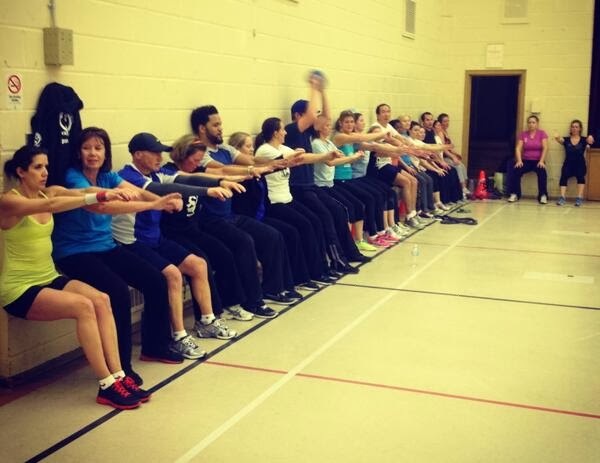 Body Buster Fitness Bootcamps can absolutely help beat the February Blahs! Exercise is uplifting, motivating, stress-reducing and FUN with our dynamic, challenging fitness program! Not only will the exercise alone help give you a more positive mindset, but the results you will start seeing as you progress through the program will make you feel even better! You will get excited about Spring and Summer coming because you will feel healthier, stronger, more fit, and look great! REGISTER HERE for the upcoming February Program! and we are all for it!!! Body Buster Langley Bootcamp Partner Workout! Why we love it: Partner work can boost your intensity as it can spark that "friendly competition". It creates cohesion within the group and gives members the oppourtunity to change it up and really challenge themselves and each other! Body Buster Fitness will be at the Cinderella Bridal Show tomorrow in South Surrey at the Pacific Inn Hotel. If you have a wedding coming up this year, it's the perfect time to get started with a new fitness regimen. Why not try something different? Something challenging and fun that keeps you WANTING to come back for more! Fitness is easier when you have to motivation and support from others. This is why we are a group fitness environment. Instructors encourage you to push it further than you would on your own. They provide new exercises and great twists on old favourites! Come Visit Us!....We may just be offering a one-time deal on our unique Bootcamp Program! Subscribe to the Body Buster® YouTube Channel for new and exciting Fitness videos!